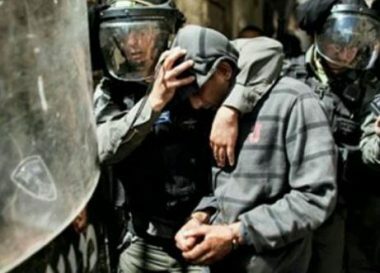 The Bethlehem office of the Palestinian Prisoners’ Society (PPS) has reported that Israeli soldiers have invaded, and ransacked homes, in the district, interrogated many Palestinians and abducted five, including two children. It stated that several army vehicles invaded Beit Fajjar town, south of Bethlehem, and abducted four Palestinians, including two children. The abducted Palestinians have been identified as Fayez Ali Deeriyya, 22, Monir Mohammad Taqatqa, 24, ‘Ala Marwan Taqatqa, 16, and Issam Mohammad Taqatqa, 16. The soldiers also invaded the Saff Street area, in the center of Bethlehem city, and abducted ‘Ala Mohammad al-Hreimi, 18, after repeatedly assaulting him in front of his family while violently searching their home. The five are among fourteen Palestinians, including a recently-released political prisoner, who were abducted by the army in different parts of the occupied West Bank, at dawn Monday.